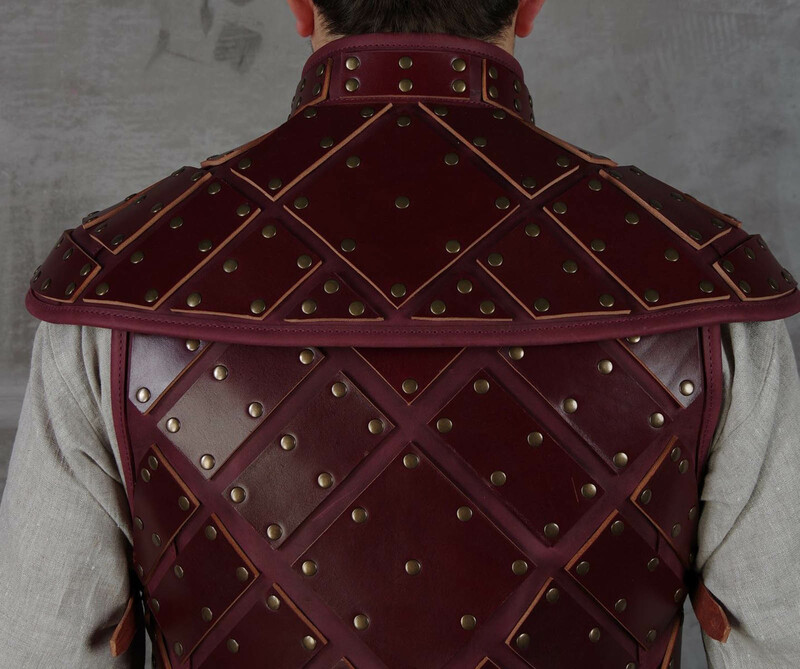 This set of leather armour is stylized design of outfit of Jon Snow (Game of Thrones). 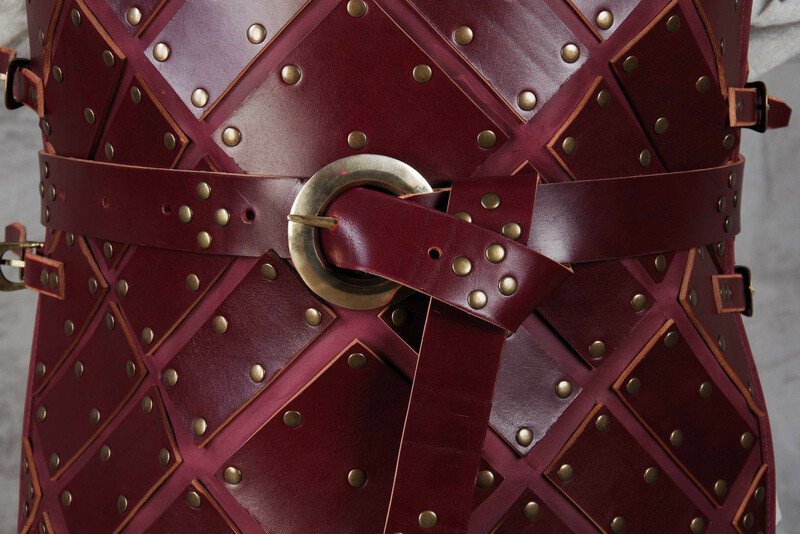 We use only natural leather of black, brown, wine red and hazel (light brown) colour for manufacture. 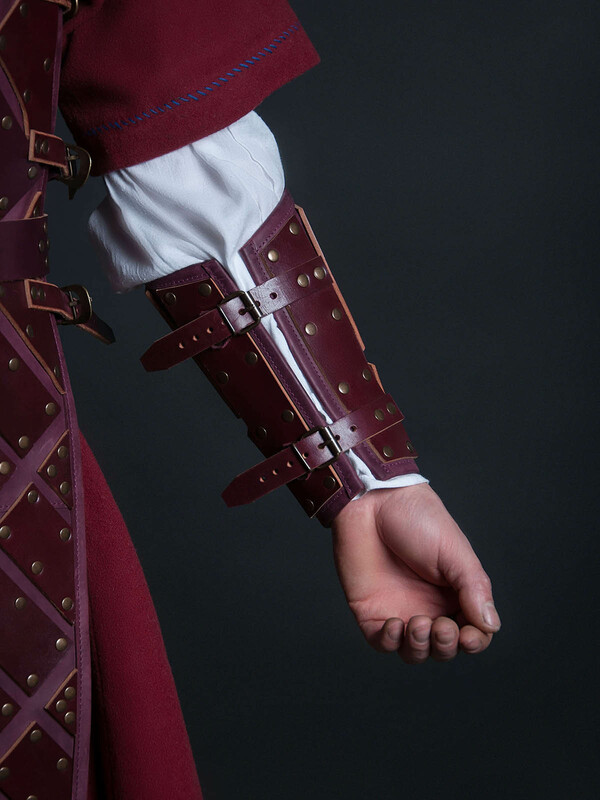 Every part of armour is handcrafted. Plates are riveted to the leather base of contrast colour. 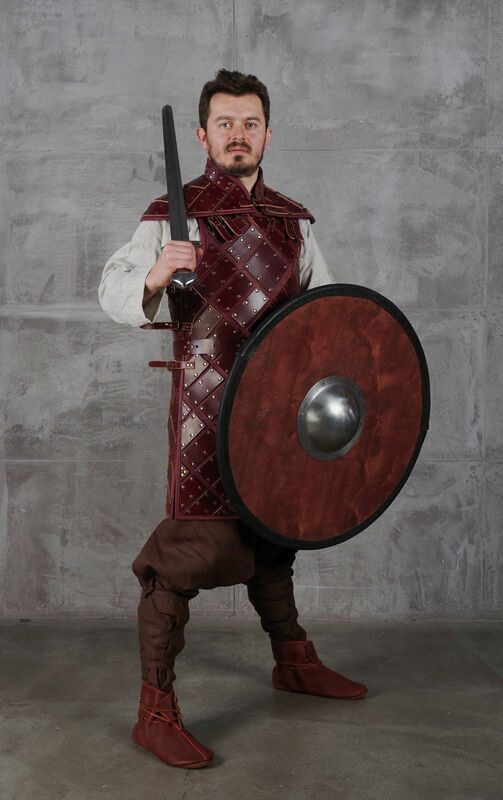 Firm leather belts with buckles fix armament on your body. Belt with cast buckle "Orlamunde" can be ordered separately. Please choose required size and colour in options. Once upon a time… When the Wall was standing, Lannisters paid their debts, a Girl did not have name, new Lord Commander of the Night’s Watch had appeared in the Castle Black on the far cold North. 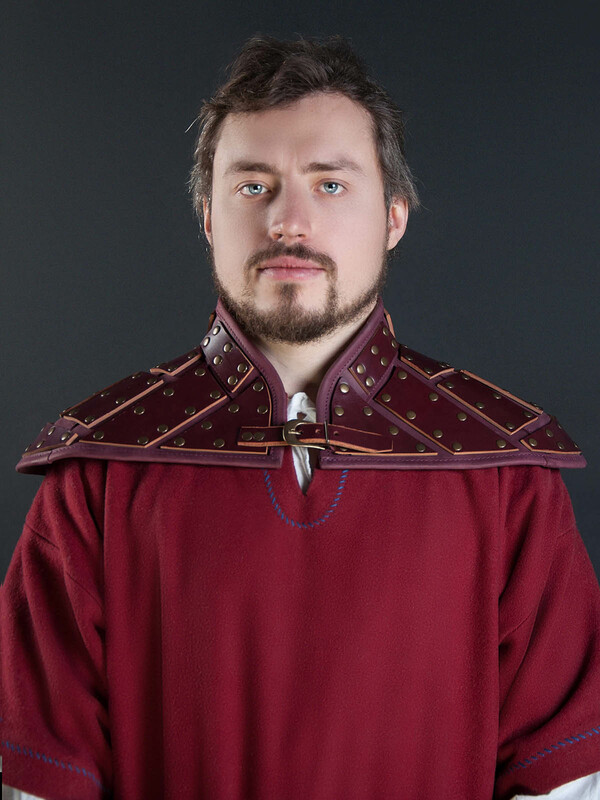 The one, who is much more attractive than all beauties of Westeros all and sundry. The one, whose curls are the most splendid and bright on both sides of the Wall. The one, whose eyes show all sadness of two continents. The one, whose handsomeness will save the World. However, only one trouble was disturbing Lord Commander more, than all these dynastic dissensions, the White Walkers and other minor problems. There were no the best armor in the Castle Black for (spoiler alert!) the most gorgeous Targaryen descendant. 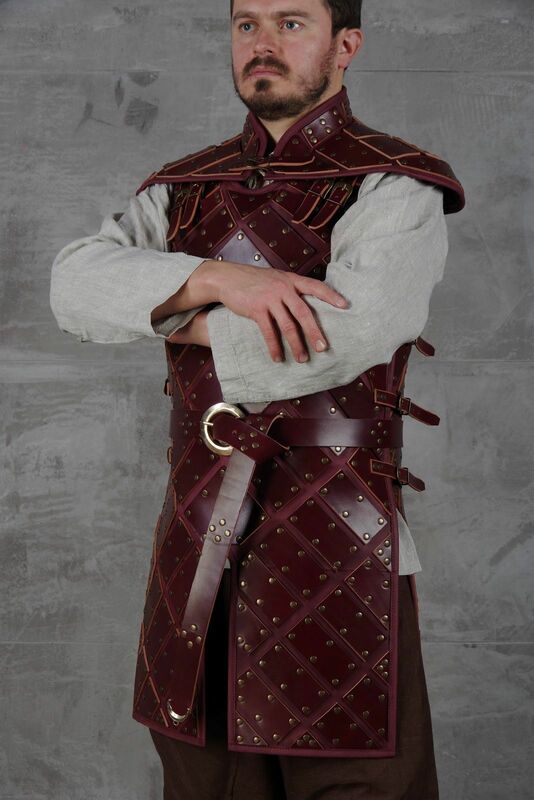 As wonderful armor should not only protect amazing body of Lord Commander of injuries. It should be warm, without cold iron, so Lord Commander wouldn’t feel cold. It should be light enough, so Lord Commander wouldn’t get tired. 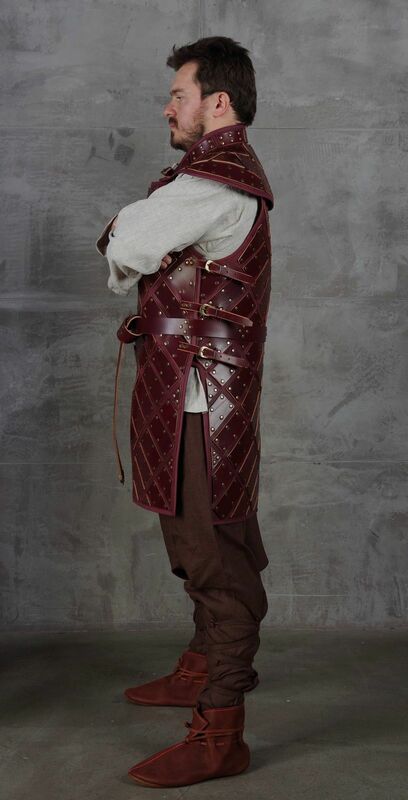 And, it should look nice, so Lord Commander wouldn’t look like a Crow. And then, the best armorers of Westeros and Essos were called to the Castle Black. For ten days and nights, they were reading secret manuscripts with instructions of old blacksmiths. For ten days and nights, they were arguing and fighting to decide, what armor is to be made. Then, during ten days and nights, restless and sleepless, they were creating the greatest work. After finishing it, they fallen dead of exhaustion and realizing that they will never create something better. But, one young apprentice was allowed for this great production to save knowledges and memory for centuries. 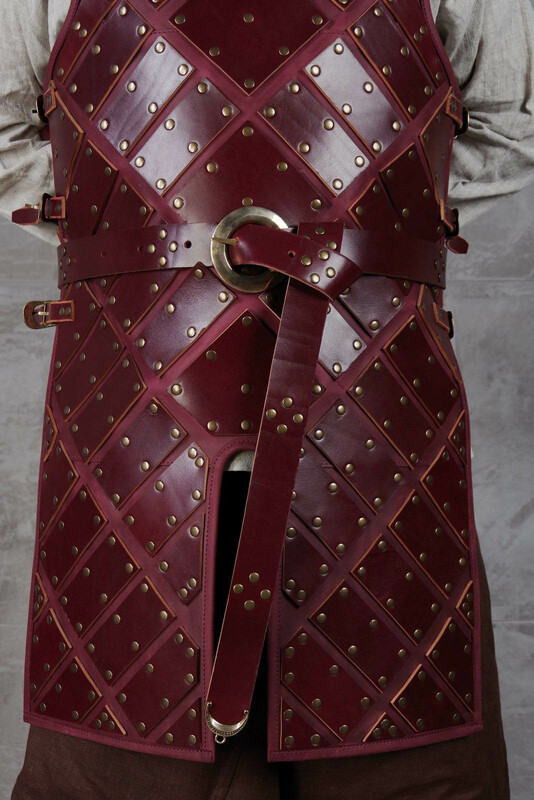 With big reverence, he passed this perfect leather armor of Jon Snow to Lord Commander. 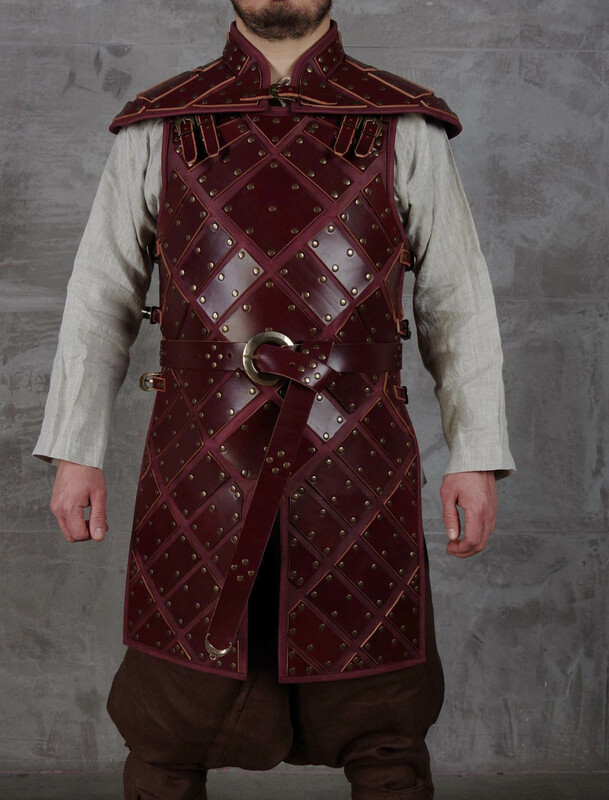 Lord Commander wore this armor and he saw it was good. For a moment, his beautiful face lighted with a smile, of which everything flourished from the Wall to the South and frozen up to the North. So, Jon Snow got his leather armor and young apprentice edged away, carrying manuscript with arcane knowledges of armor’ creating. He hid manuscript in the deep underground cave, protecting it with hundreds of traps. Though, special agents of Steel Mastery bridged over all difficulties and got ancient science. And, following secret drawings, we created armor as Jon Snow had, and even better. 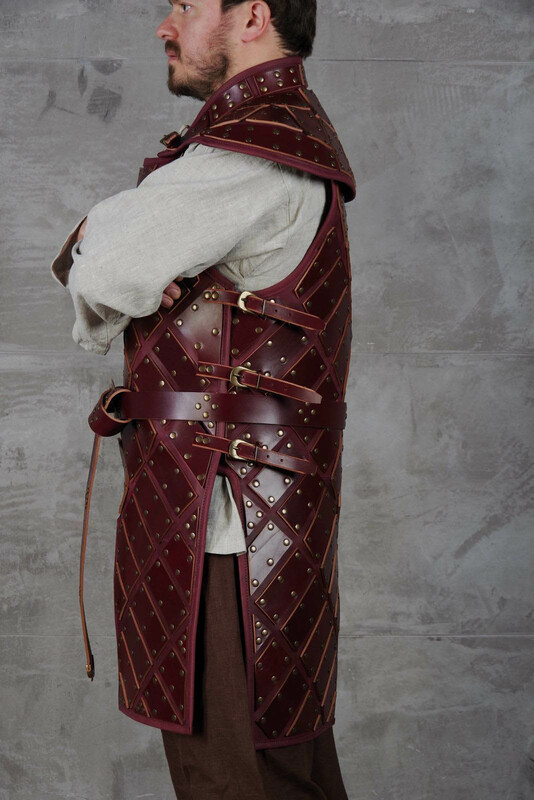 Armor includes long leather cuirass and pelerine, each part of which was made anxiously with big love. 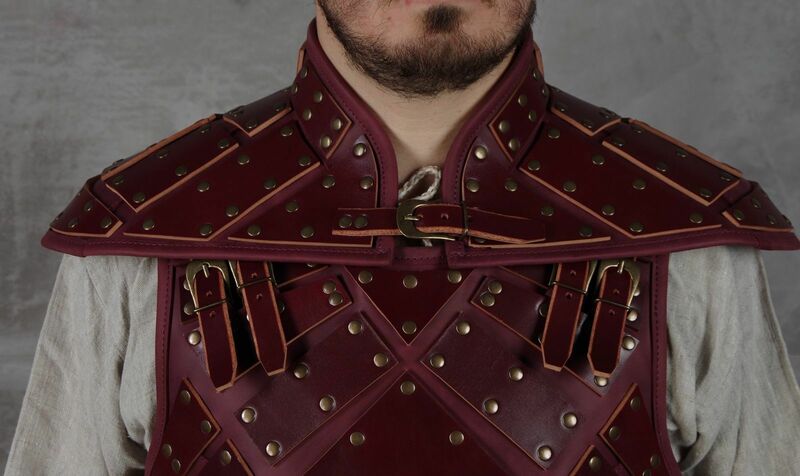 Steel Mastery is ready to make such custom body armor for your individual parameter in leather of any color. 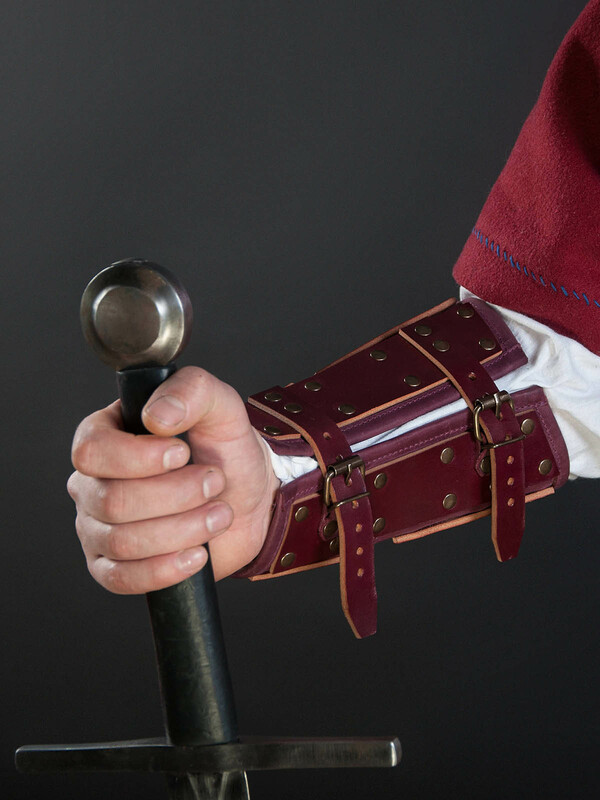 Leather belt with handcrafted buckle “Orlamunde” can be ordered separately in our medieval armour shop. Order, wear and remember – beauty will save the world! 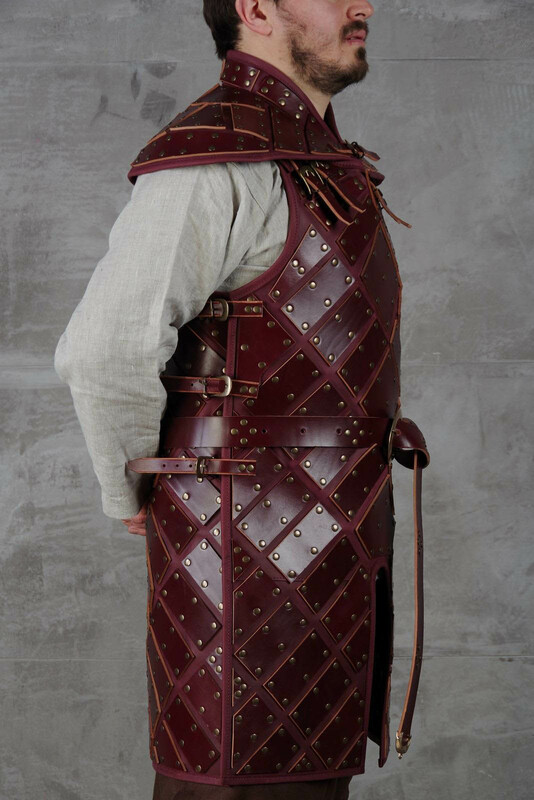 Medieval leather gambeson (gambison) was widespread in the XI-XV centuries. This padded jacket was popular among all service branches. As common infantrymen, so noble warriors were using it. 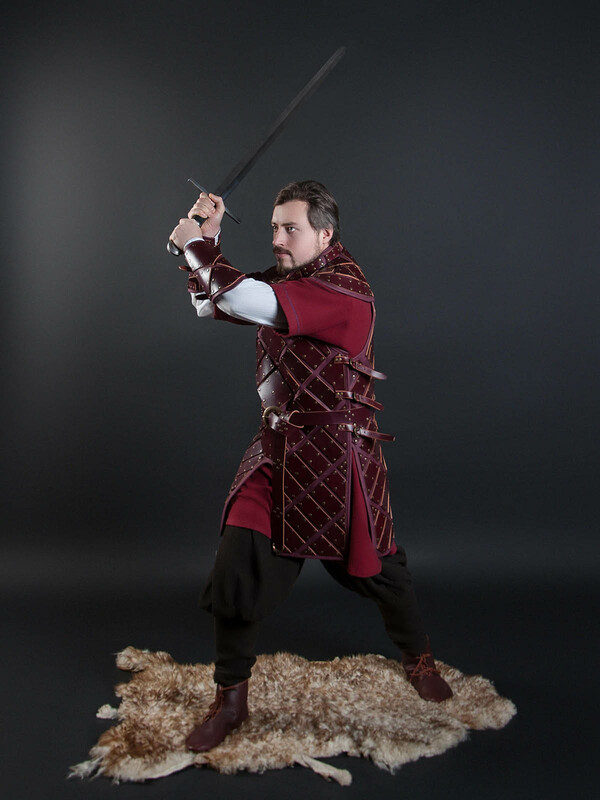 Especially, when such leather gambeson armour was combined with chainmail, that made owner protected at the high level. 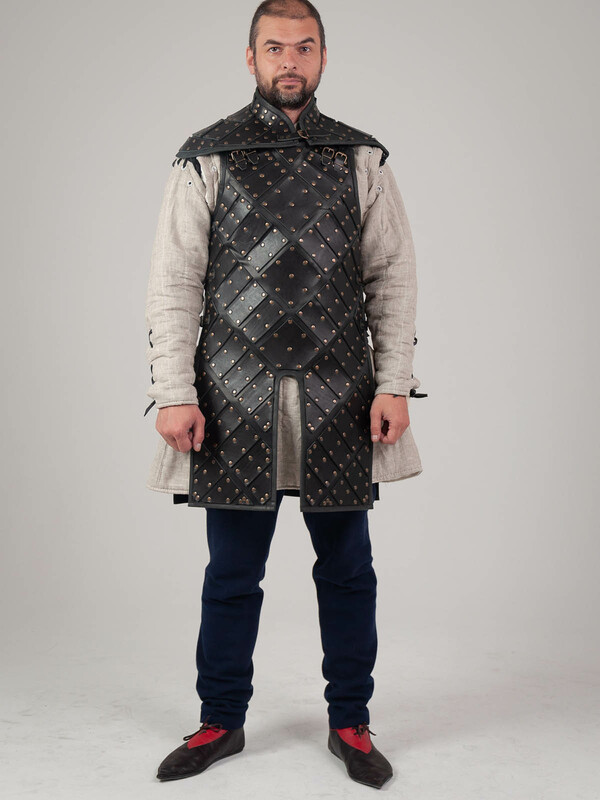 Made-to-measure gambeson may be sewn by two ways: Machine manufacturing. 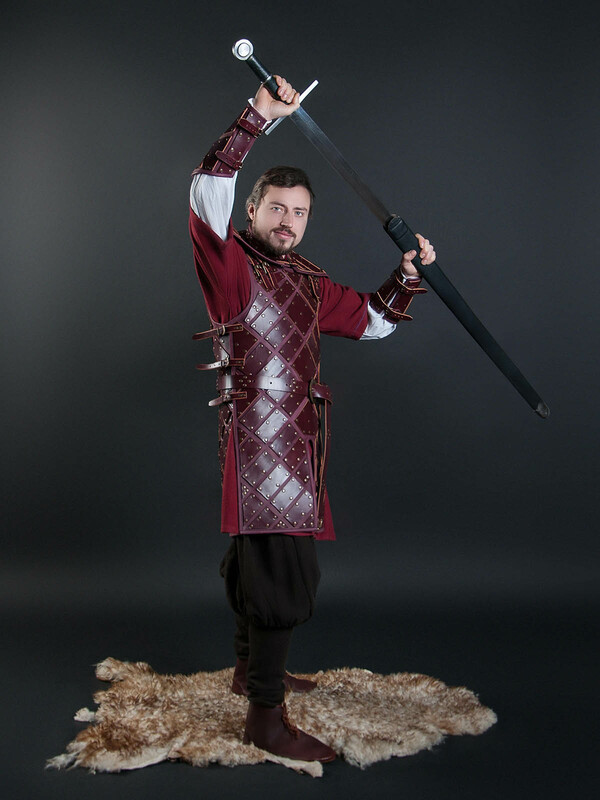 Tailors will make padded armor by your parameters, using sewing machine. Hand sewing. 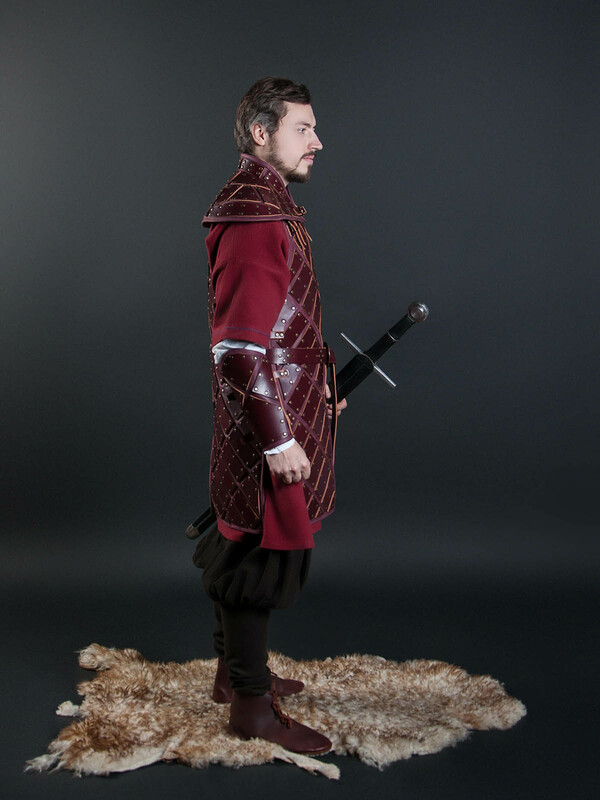 Custom gambeson will be completely sewn by hands of our tailors. Such type of manufacture is historical one and is offered for additional costs. 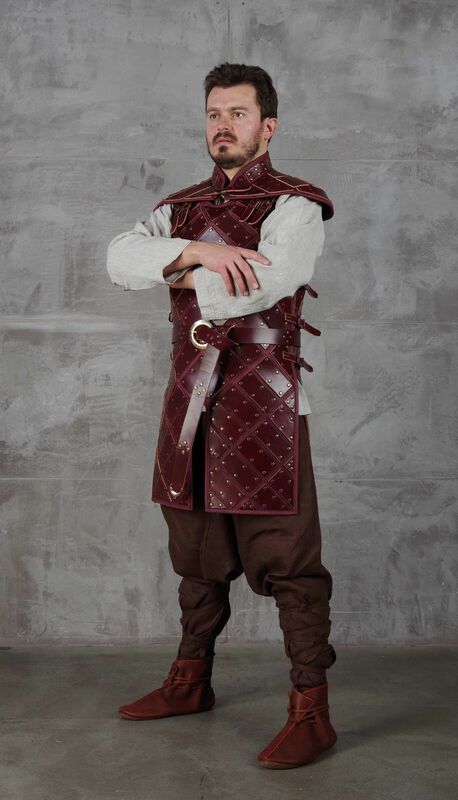 You can use this leather gambeson for: SCA HEMA Larp Stage performances Medieval festivals Reenactment events Base price includes following options: 1-2 layers of padding (natural sheet wadding 50% cotton, 50% wool); Natural (uncoloured) leather for outer shell; Natural (uncoloured) cotton for inner shell; XS-size; Straight bottom edge; Black leather straps with handcrafted br.. 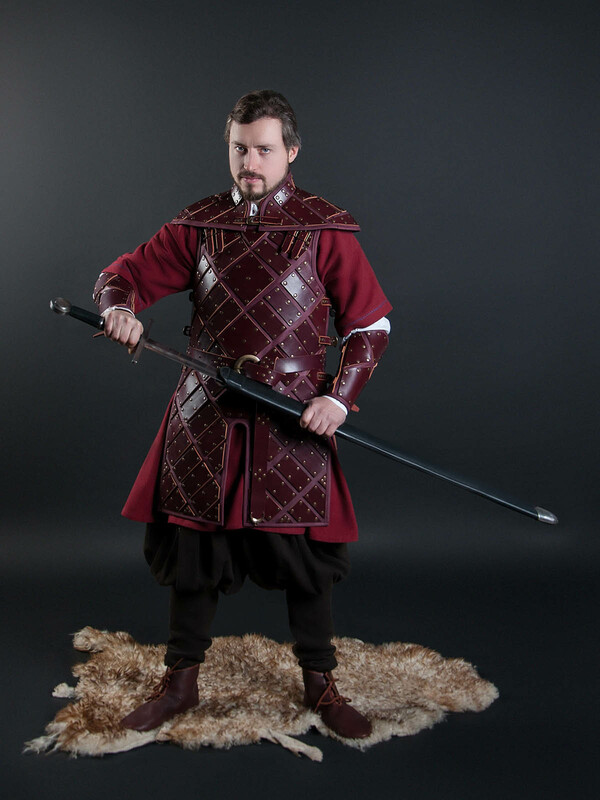 Medieval aketon of leather was popular in the XV century. 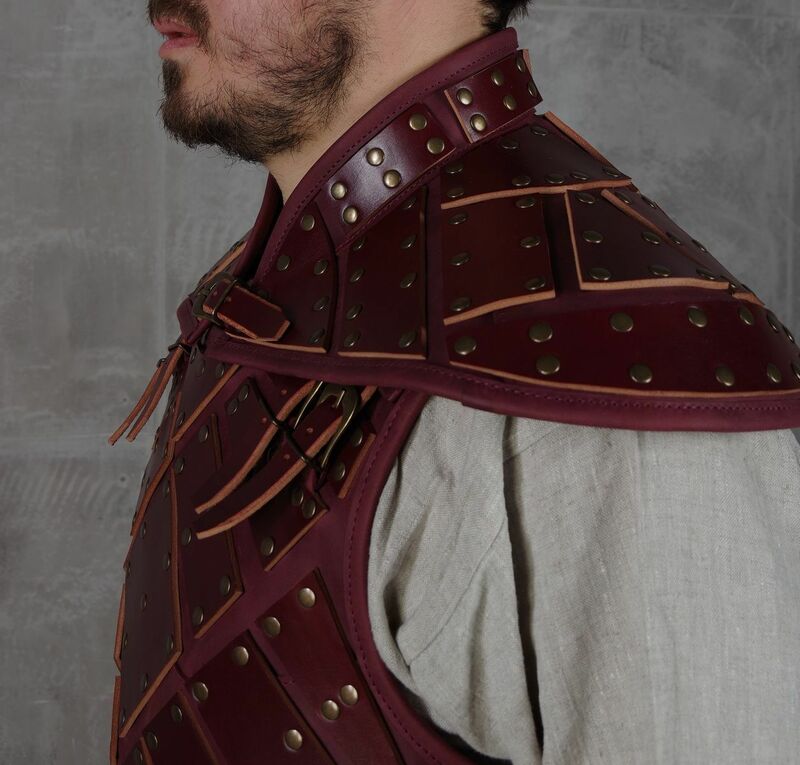 As leather is very firm material, warriors who were taking participation in close fights used such aketons more often. 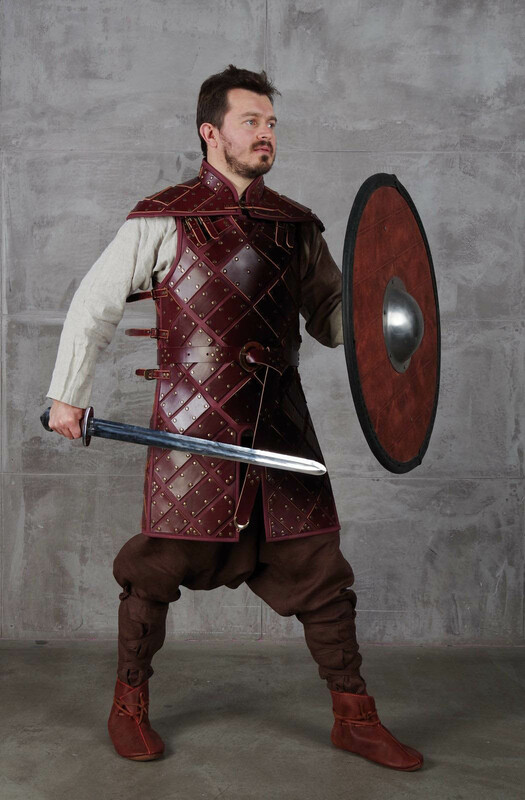 Combined with chainmail, such leather gambeson armor was a perfect body protection. 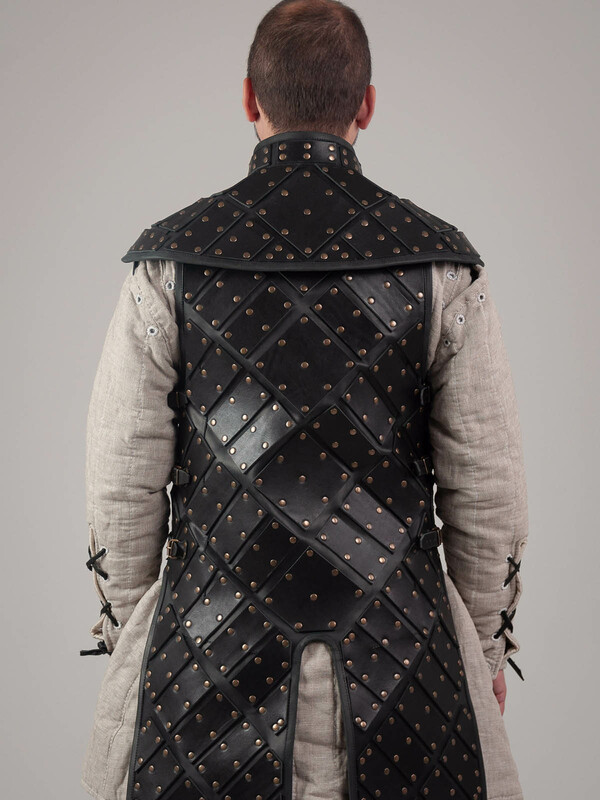 Made-to-measure gambeson may be sewn by two ways: Machine manufacturing. 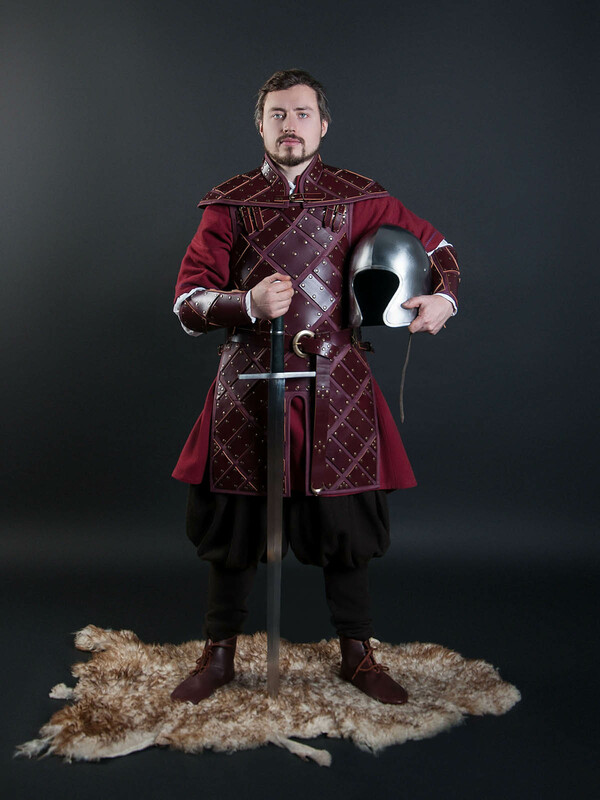 Tailors will make padded armor by your parameters, using sewing machine. Hand sewing. 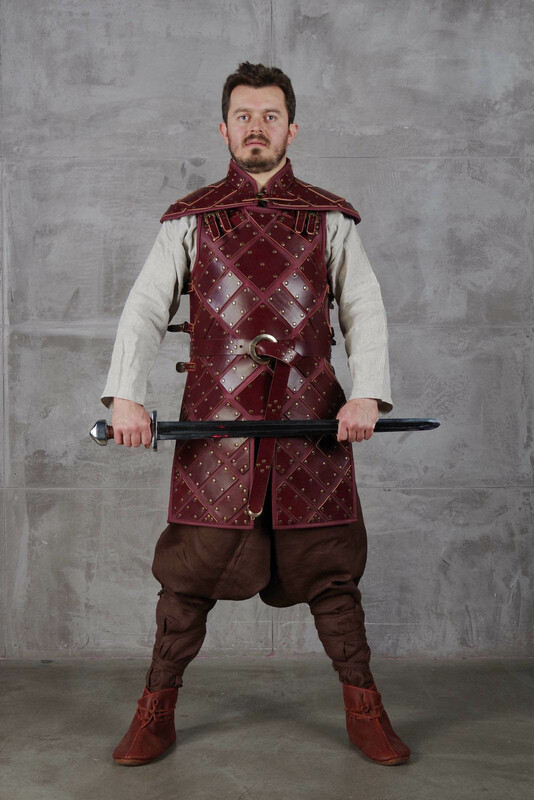 Custom gambeson armour will be completely sewn by hands of our tailors. Such type of manufacture is historical one and is offered for additional costs. 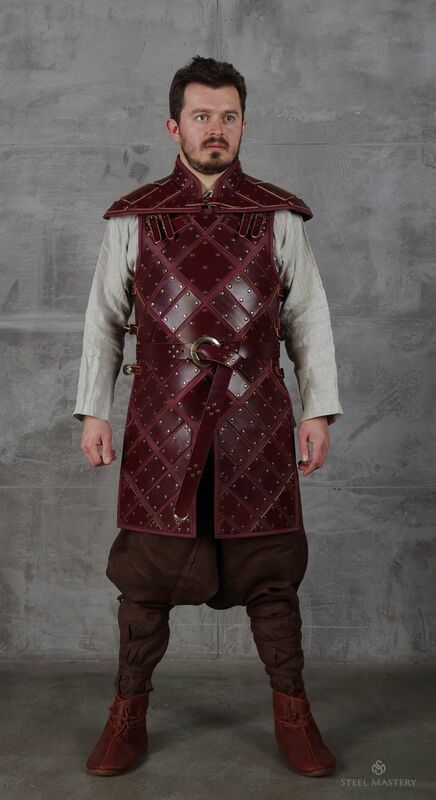 You can use this leather gambeson for: SCA HEMA Larp Stage performances Medieval festivals Reenactment events Base price includes following options: 1-2 layers of padding (natural sheet wadding 50% cotton, 50% wool); Natural (uncoloured) leather for outer shell; Natural (uncoloured) cotton for inner shell; XS-size; Straight bottom edge; Black leather straps for fastening on the side of collar; Standard attaching of..
Beautiful work ! fit perfectly to me and awesome details ! Recommended !